THE SURREY PUMA: Was it the Surrey puma ? 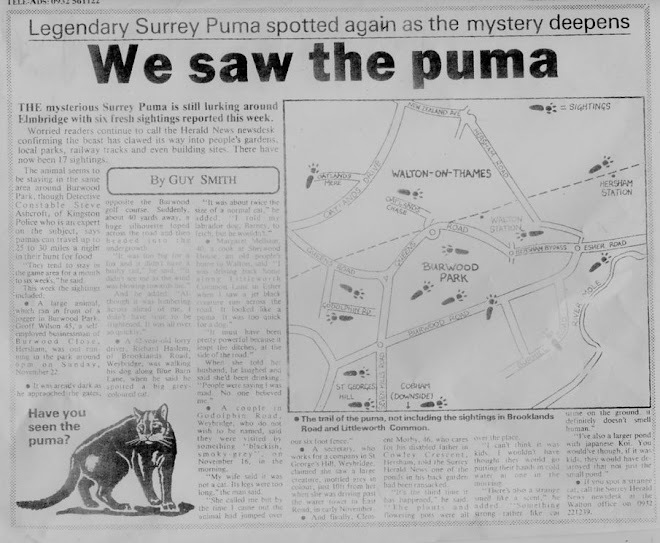 Was it the Surrey puma ? At the end of May 2011 a Dorking woman, whilst jogging through woods near her home, was spooked by a large animal which leaped down from a tree behind her and onto a woodland path, making a light thud. Although the witness never saw the animal, she was so terrified she rang her husband. Further investigations revealed that whatever had sprang from the tree had left large paw prints on the path.